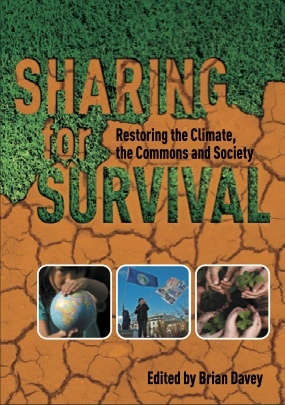 Welcome to the online edition of Feasta’s book, Sharing for Survival, a 200-page collection of essays by nine Feasta Climate Group members. The book’s editor, ecological economist Brian Davey, is a long-time Feasta member and co-ordinator of the Cap and Share campaign for cutting carbon emissions. Other authors include Nick Bardsley, James Bruges, John Jopling, Justin Kenrick, Laurence Matthews and Caroline Whyte. The book concludes with the final piece of work by our much-loved late colleague, Richard Douthwaite, with help from David Knight: an essay entitled “Time for some optimism about the climate crisis”. The UK launch of the book took place on April 13th 2012 in Machynlleth, Wales, as the kick-off for the Feasta Climate Group weekend. The Irish launch was held on May 18th in Cloughjordan, Co. Tipperary, the home of Ireland’s first eco-village. look at climate policy from the point of view of the countries of the south. This book offers a historically rich and nuanced introduction to a concept that could not be of more pressing importance for the twenty-first century. The book’s price is £14.99/€17.50. Note, Jan 5 2015: Owing to problems with spam we have had to disable comments on this website. If you wish to comment on any aspect of this website or book please email website [AT] feasta.org.